What's in the DVD ? At Mandarin Oriental Hotel, Makati on November 5, 2004. At TGIF, New Brunswick, NJ on December 28, 2013.
an extension 'exe' under the folder 'Executables'. Who's Behind This Project ? transition effects, to the DVD label. He ordered 25 copies of the DVD and will soon be shipped to our dear friends and fellow FL'ers. average cost per DVD = $0.85. rate) of $40.00 per hour, I'll let you do the math. Scanning of pictures from prints are extra $1.00 per image. proper placement within the presentation. Now, how much really is the DVD ? 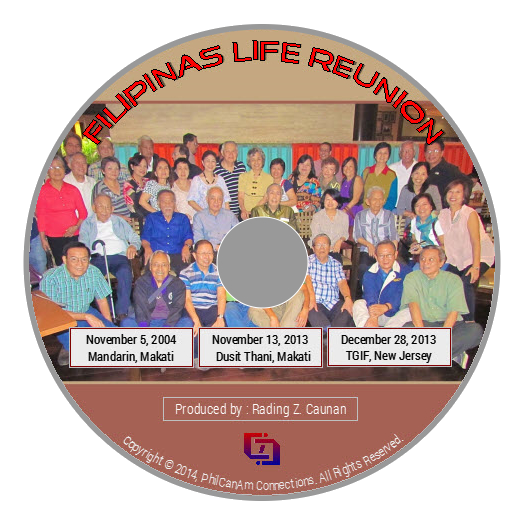 order your copy of the DVD.